On Thursday, July 5 at 7:30 p.m., members of the Praeclara Vocal Company will perform as part of a recital presented by international tenor Neal Banerjee at Wildwood Park for the Arts. The recital is the first of three concerts in the WAMA 2018 Summer Concert Series. Proceeds from all three concerts support the scholarship program at the Wildwood Academy of Music and the Arts, which provides summer arts and music education for children from all over Arkansas. Admission is $15, and tickets can be purchased up to two hours before the performance at wildwoodpark.org. They can also be purchased at the door the evening of the performance. Banerjee’s recital will showcase songs from the German lieder tradition of the 19th century, including works by Richard Strauss, Johannes Brahms, Robert Schumann, and Franz Schubert. These lieder are also called “art songs” because they combine poetry lyrics with classical music. Songs in this tradition are exquisitely beautiful, composed for a solo voice and piano, filled with dreamscape-style images of nature, love, and loss. In the days of the Romantic German composers, singers often performed in the homes of their patrons, presenting intimate “parlor concerts” to an audience of close friends and other artists. In keeping with this tradition, the audience for this concert will be seated in a “reversed staging” arrangement on the stage of the Cabe Festival Theatre, with the performance taking place right before the audience as if they were seated in a cozy parlor. Banerjee will be accompanied in his solo work by accomplished Little Rock pianist and organist Adam Savacool. 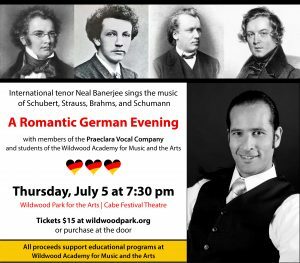 The natural beauty of Wildwood Park provides the perfect setting for a concert of Romantic era music. And there is no better musician to present this music than Banerjee, a professional singer, composer, and music director originally from Canada who once visited Germany on a tour and fell so much in love with the country that he decided immediately to make it his permanent home. In addition to the German lieder, Banerjee’s program also includes choral performances, in which he will collaborate with professionals from the Praeclara Vocal Company and advanced vocal students from the Wildwood Academy of Music and the Arts (WAMA), who make up the WAMA Festival Chorus. 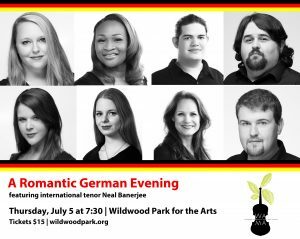 Keeping with the German theme, Banerjee and the choir will present selections from the Liebeslieder Walzer by Johannes Brahms, a work that requires two accompanists to play a single piano at the same time while the choir sings. Participating Praeclara Vocal Company members include Melanie Hanna, Satia Spencer, Luke Angelo, Ethan Ezell, Shea Williamson, Elizabeth Riddick, Kira Keating, Janette Robinson, and Kevin Ezell, with Praeclara guest artists Jon Davies (Pirates of Penzance) and Jon Stevenson (Elijah); they will be accompanied by the duo of Leann Hatley and Samuel Schalchlin at the piano. The choir will also sing Banerjee’s original compositions, Gloria and Ave Verum Corpus.